Sunday marks the 105th anniversary of Seattle's first rapid-rail network measure. It failed by a 2-to-1 margin on March 5, 1912. 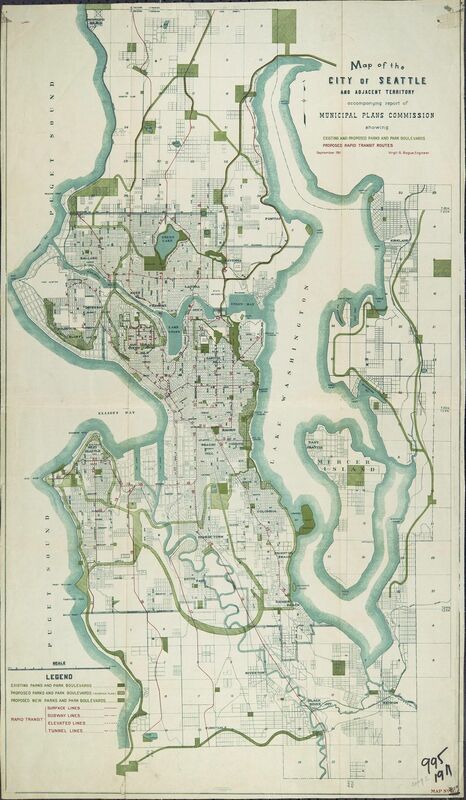 On March 5, 1912, Seattleites by a vote of 24,966 to 14,506 rejected an ambitious 91-mile urban rail network. Had the “Plan of Seattle” passed, the urban and transportation framework created by Municipal Planning Director Virgil Gay Bogue would have created a network of more than 20 rapid-train routes. Neighborhoods in every corner of the city – from West Seattle, South Park, Georgetown and the Rainier Valley in the south, to Ballard, Greenwood and Ravenna in the north – would have been linked by a rail system that included 33 miles of subway, 5.5 miles of tunnel, 27.4 miles of Chicago-style elevated rail, and 24.85 miles of surface rail. “The city’s growth will be retarded with a tendency to develop congested, undesirable and unhealthful districts unless rapid-transit facilities are provided,” Bogue warned in his plan. 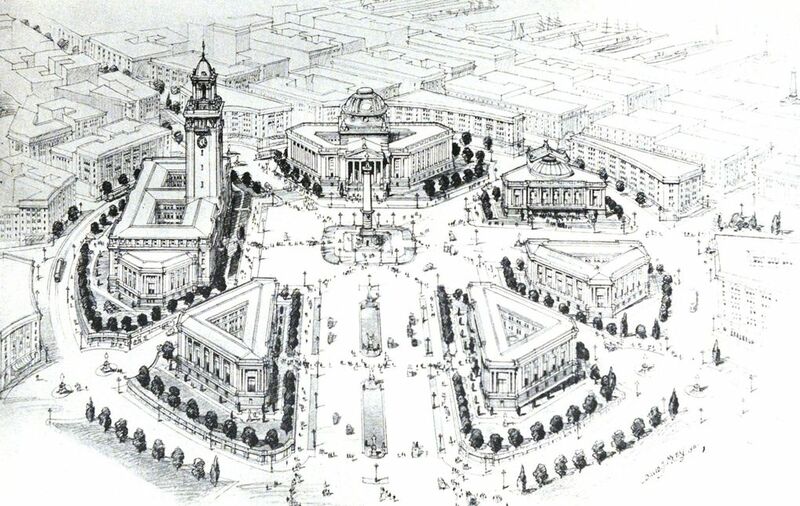 Influenced by the City Beautiful Movement, Bogue’s plan for the city also envisioned a large European-style Civic Center and plaza located near what is now Belltown around Fourth Avenue and Blanchard Street. The Civic Center plan included a towering Central Station designed in the neo-classical architectural style that would have been anchored at the southwest corner of Lake Union. Like the spokes of a wheel, many of the proposed train routes would have branched out from this civic and transit hub in Belltown, and connected to the city’s neighborhoods, which Bogue planned to be built with density in mind – his vision was of a Seattle with 1 million people. And 105 years ago Sunday, Seattle voters agreed by a 2-to-1 margin that the plan was too costly. Had the “Plan of Seattle” moved forward, the train network had a projected completion date of 1935, a full century before Sound Transit 3’s Seattle-to-Ballard line expects to run its first light-rail trains.